Fig. 1. Mitotic chromosomes from a male third instar larval brain stained with aceto-orcein. This metaphase spread was prepared as described in ref. 41 without colchicine or hypotonic treatment. The secondary constriction of chromosome 2 is marked with an arrow. Note the homologous associations first observed by Stevens (7). A helpful guide to mitotic chromosome morphology and landmarks (e.g., primary and secondary constrictions) is Kaufmann's 1934 article "Somatic mitoses of Drosophila melanogaster" (26). 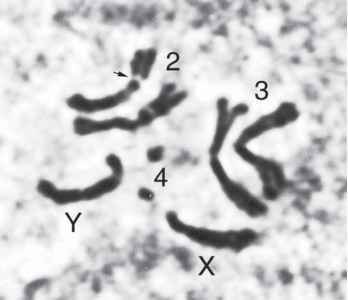 See also Cooper's 1959 study of the X and Y chromosomes (30). prominent secondary constriction in its left arm (see Fig. 1 and ref. 26). Unambiguous identification can be achieved by using the DNA stains Hoechst 33258, quinacrine, or 4',6-diamidino-2-phenylindole (DAPI), which produce fluorescence banding patterns characteristic for each chromosome arm (see Chapter 16 and refs. 42,43). Female Drosophila have two X chromosomes and males have one X and one Y. The X chromosome (also sometimes referred to as the first chromosome) is slightly larger than a single arm of chromosome 2 or 3 and very nearly acrocentric. The heterochromatic Y chromosome is divided into short (YS) and long (YL) arms. YS and the proximal part of the X both possess a nucleolus organizer region (NOR) of 18S and 28S ribosomal-DNA tandem repeats. Spacer regions between rDNA repeat units mediate X-Y pairing to achieve normal disjunction in male meiosis (1,44,45). Otherwise, the X and Y chromosomes are nonhomologous, except where they share simple satellite and certain other repetitive DNAs (e.g., refs. 46,47). 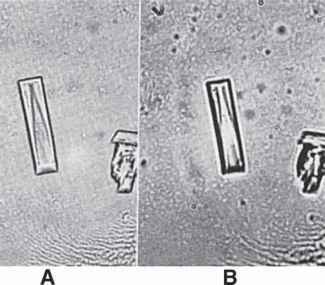 Two simple treatments can improve mitotic chromosome cytology (see Chapter 16). First, incubating the larval brain in 1 mM colchicine prior to squashing increases the proportion of cells in mitosis (i.e., the mitotic index). Colchicine, an alkaloid derived from certain plants of the lily family (e.g., Colchicum autumnale), interferes with spindle assembly and thereby prevents cells from entering anaphase. The chromosomes in colchicine-treated cells show both increased condensation and repulsion of sister chromatid arms, a phenotype referred to as a "C-metaphase" (or "C-mitosis"). Colchicine treatment can sometimes cause even the centromeric regions of sister chromatids to come apart, generating a configuration of closely aligned sisters termed a "ski anaphase" (e.g., ref. 48). A similar phenotype of chromatid separation can be seen in brains of mutants defective in a spindle checkpoint function, even in the absence of colchicine (49). Incubation in sodium citrate solution typically follows colchicine treatment. Hypotonic sodium citrate causes nuclear swelling and spreads the chromosomes apart. The combination of colchicine treatment and hypotonic shock is useful in karyotyping or when investigating the possibility of chromosome breakage because it results in large numbers of mitotic figures and makes individual chromosomes and any fragments of chromosomes (and chromatids) easier to observe (e.g., refs. 50,51). Hypotonic shock alone is also routinely applied in studies of mitotic figures (see Chapters 16 and 17), but it can disrupt chromatin organization in interphase nuclei (e.g., ref. 48).